Engraving by Domenico del Barbiere, 32.9 x 22.8 L (London). Inscribed at the upper left: AMPHIARAO, and on a slip of paper set against the plant at the lower left: DOMENICO . / DE LBARBIER . Heinecken, II, 1788, 163, as Barbiere after Primaticcio. Bartsch, XVI, 1818, 358, 4, as after Rosso. Le Blanc, 1854-1890, I, 147, 7, as after Rosso. Herbet, III, 1899, 9-10 (1969, 97-98), 4, indicating that Heinecken thought it was after Primaticcio, and Bartsch after Rosso. Zerner, 1969, XXXVIII, and D.B.6, as probably designed by Barbiere himself, 1540-1545. COLLECTIONS: London, Sotheby’s, 28 November 1979, lot 858, with a double C watermark indicating 17th century paper, according to Wardropper, 1985, 70, 81, n. 135. London, 1851-2-8-100. Los Angeles (Ruiz). Naples, Capodimonte, LXX, 93846. New York, 49.95.1883, damaged, especially at bottom. Paris, Ba I XVIe siècle. Paris, Ensba. Vienna, I.III.3, p.49. Kusenberg, 1931, 157, 159, as after Rosso. Oberhuber, 1966, 151, no. 245, as after Rosso. Béguin, in RdA, 1969, 103-104, Fig. 7 (Paris, Ensba), by implication as after a design by the engraver. Zerner, in EdF, 1972, 276, no. 335, 277, ill. (Paris, Ensba), and in Fontainebleau, 1973, I, 70, Fig. 37, II, 86, no. 335, as after Barbiere’s design. Borea, 1979, 371, as Barbiere’s invention. Borea, 1980, 233, ill. (Naples), 278, no. 766, design by Barbiere. Lévèque, 1984, 126, 127, Fig. (Paris, Ensba). Wardropper, 1985, 24, 25, 34, 35, 37, 50-54, 69, Fig. 11, indicated that late changes in the plate suggest that the design is Barbiere’s. Marianne Grivel, in Ronsard, 1985, 79, Fig., 84, no. 104 (Paris), as Barbiere’s composition. 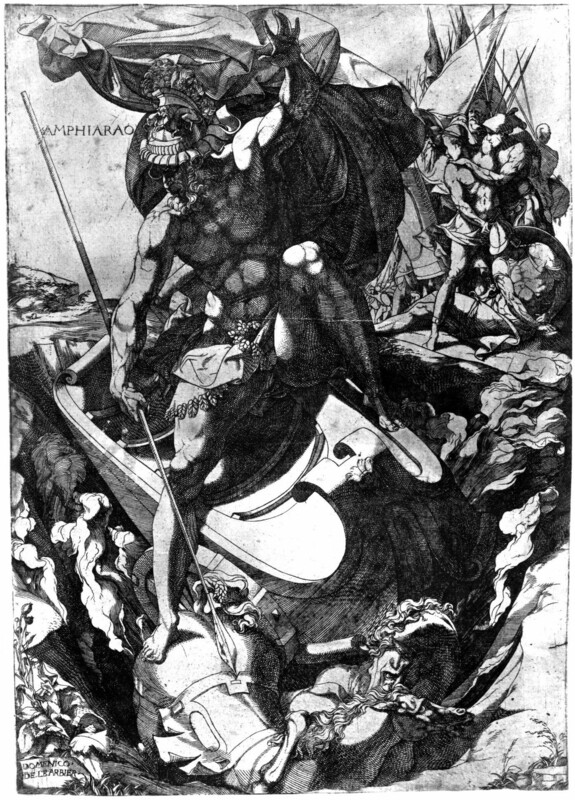 E. Hevers, in Zauber der Medusa, 1987, 202, no. IV, 10, Fig. (Paris, Ensba, inv. no. 8). Davis, 1988, 162-163, no. 62, Fig. (Los Angeles, Ruiz), with bibliography, as after Rosso. Wardropper, in French Renaissance, 1994, 288-290, no. 67, Fig. (Paris, Ed 8b réserve, vol. 1b), as Barbiere, perhaps 1543-1544, after his own design. Although the design of this engraving has long been attributed to Rosso, it was once also given to Primaticcio. The influence of both is visible in this image, the dramatic foreshortening, tight musculature, and brilliant, sharp details recalling Rosso, the tapering grace of the forms suggesting Primaticcio. 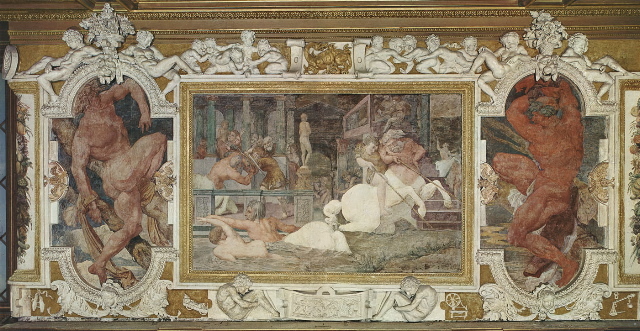 It is this combination of stylistic sources that hinders the acceptance of Rosso as the author of the composition, although Davis, 1988, maintained him as the inventor on the basis of comparisons – insufficient, in my opinion – with the figures flanking the Education of Achilles (Fig.P.22, II N a) and with one in the foreground of the Enlightenment of Francis I (Fig.P.22, VII S a) in the Gallery of Francis I. None of the figures by Rosso that Davis brings forth has the elongated proportions or the poise of the engraved Amphiaraus. It is very likely, as Zerner suggested, that the design is by Barbiere himself.